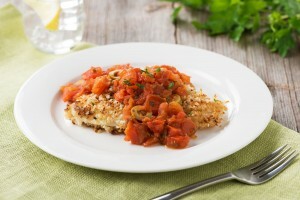 The flavor and essence of orange is a delightful marriage with tomatoes; creating a light and freshly flavored sauce laced over fillets of sole. For a delightfully simple dinner serve with steamed beans. Dip fish fillets into milk the bread crumbs. Salt and pepper to taste and set aside. In a large sauté pan, warm olive oil over medium-high heat. Place fillets in pan and cook about 5 minutes on each side, or until flaky. Transfer fish to a oven proof platter and place in warm oven. In the same skillet add the wine; scrape up any bits in the pan. Add tomatoes, hot pepper flakes, tarragon, parsley, olives, juice and zest of orange and cook over medium high heat. Reduce liquid until thickened, about 15 minutes. Spoon sauce over fish, and garnish with chopped parsley. Serve immediately.